What can I expect from Policy Control extension? Policy Control is designed to let you easily have control over data flow in your browser. 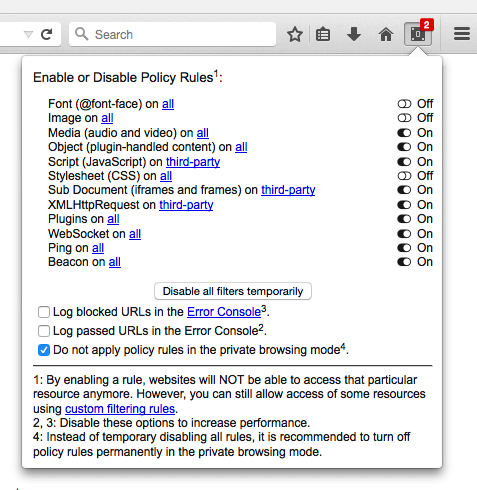 It can block certain types of requests by simply turning on a policy rule from the toolbar panel. You have either control to block all the incoming resources or just requests made by third-party servers. For advanced users, there is a filtering page to define customized blocking rules. Why there are two types of blockage (all and third-party)? Well, it really depends on how you want to use Policy Control extension. If you just want to block some resources to speed-up your browser, then always use "all" blockage mode. Usually blocking images and web fonts are sufficient to enhance your browsing speed. However, if you want to improve your privacy by using the "Policy Control" extension, then it is recommended to turn on all the filtering rules for third-party hostnames. Usually, malicious scripts are not hosted by the visited domains but they are injected by third-party networks. WWhat is the meaning of "hostname" and "origin" keywords that are used in this extension? Consider a URL like "https://www.google.com/index.html" for instance. In this URL, "www.google.com" is the hostname and "https://www.google.com/" is the origin. For performance consideration, this extension uses the origin matching. However to enhance filtering capability you can still use one or more "*" in the filtering rules (wildcard matching). Is "Policy Control" extension useful to increase my privacy? Yes, Policy Control can block some important sources to prevent privacy leakage. Read more here; HTML5 APIs Fingerprint Users - How to Prevent. I am an average user concerned about my privacy and security. Is there any recommended settings for me? You can start with the following settings and add exceptions when needed. For isntance by using the following settings, YouTube embedded players are not being loaded. Either you need to change the global settings or add exception rules. I am using the "Policy Control" extension by enabling some policy rules like blocking third-party scripts, but some websites are not loading properly. What can I do? You have two options. If you are visiting this particular website frequently, it is recommended to add the resource(s) that may cause the website to not load properly into the white-list page. Read below to find out how to add a new rule to the white-list page. However, if you are not a frequent visitor of this page, you still have two options: Either disable all the policy rules temporarily and refresh the page (when the page is loaded, you can enable rules once again from the popup). Or you can use your browser in a private mode to browse this page (by default "Policy Control" extension is disabled in the private (incognito) mode [private mode has no access to your sensitive cookies and browser history.]). This is the recommended method. How can I add a new rule to the white-list page? The easiest method is to load the page and let the extension log the blocked resources for you. Now open the popup and press on the "Open Log" button. In the newly opened page, find those resources that you need to allow globally and press the "Allow" button. As an alternative method, you can open the popup and define a new rule just for this particular hostname. Don't forget to check the "Apply these rules for this hostname" checkbox. Now press the "Save" button. To remove site-specific rules, open the popup once the website is loaded and uncheck the box and then press the save button. Is it possible to move the toolbar button? Yes, there is a comprehensive guide on how to customize your Firefox in this blog post: a Comprehensive Guide to Firefox Customization. The badge indicates the number of blocked resources for the currently visited webpage. If the page is not loading properly, read FAQ 5 to let some resources pass the enabled policy rules. Why do I still get images on a website when the image rule is set to "Block all"? [JPM Version ONLY] How can I read a Policy Rule in the panel? Lets take a look at an example: Font (@font-face) on all, off. Basically there are two settings per each policy rule. The first one is all or third-party which indicates the scope of the rule. Whether all resources are supposed to be blocked or only resources requested by third-party websites on a top level domain. The other control is on and off. This control indicates whether a policy rule is enabled (on) or it is disabled (off). Note that after installation, all the policy rules are off. Meaning there is no blockage at all. You have to manually turn on a rule and this selection is permanent until you decide to turn it off.